This is the class for nodes presenting opertors used in an evaluation trees. Definition at line 32 of file CEvaluationNodeLogical.h. Enumeration of possible node types. Definition at line 38 of file CEvaluationNodeLogical.h. Definition at line 21 of file CEvaluationNodeLogical.cpp. Definition at line 27 of file CEvaluationNodeLogical.cpp. References AND, EQ, GE, GT, LE, LT, CEvaluationNode::mPrecedence, CEvaluationNode::mType, NE, OR, PRECEDENCE_LOGIG_AND, PRECEDENCE_LOGIG_EQ, PRECEDENCE_LOGIG_GE, PRECEDENCE_LOGIG_GT, PRECEDENCE_LOGIG_LE, PRECEDENCE_LOGIG_LT, PRECEDENCE_LOGIG_NE, PRECEDENCE_LOGIG_OR, PRECEDENCE_LOGIG_XOR, and XOR. Definition at line 73 of file CEvaluationNodeLogical.cpp. Definition at line 79 of file CEvaluationNodeLogical.cpp. Calculate the numerical result of the node. It is assumed that all child nodes are up to date. Definition at line 84 of file CEvaluationNodeLogical.h. 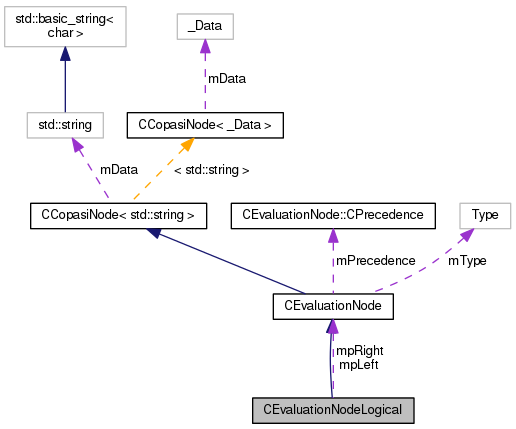 References AND, EQ, GE, CEvaluationNode::getValue(), GT, LE, LT, mpLeft, mpRight, CEvaluationNode::mType, CEvaluationNode::mValue, NE, OR, and XOR. Definition at line 81 of file CEvaluationNodeLogical.cpp. References CCopasiNode< std::string >::getChild(), CCopasiNode< _Data >::getSibling(), mpLeft, and mpRight. Referenced by getBerkeleyMadonnaString(), getCCodeString(), getDisplayString(), getInfix(), getMMLString(), and getXPPString(). Definition at line 357 of file CEvaluationNodeLogical.cpp. References CCopasiNode< _Data >::addChild(), AND, CEvaluationNodeLogical(), EQ, CEvaluationNodeConstant::FALSE, GE, GT, INVALID, LE, LT, NE, OR, CEvaluationNode::subType(), CEvaluationNodeConstant::TRUE, and XOR. Retrieve the display string of the node and its eventual child nodes in Berkeley Madonna format. Definition at line 223 of file CEvaluationNodeLogical.cpp. References AND, compile(), EQ, GE, CEvaluationNode::getType(), GT, LE, LT, mpLeft, mpRight, NE, OR, and CEvaluationNode::subType(). 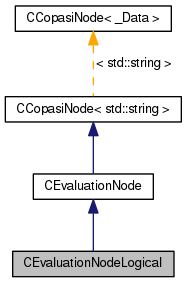 Retrieve the display string of the node and its eventual child nodes in C.
Definition at line 145 of file CEvaluationNodeLogical.cpp. Retrieve the display string of the node and its eventual child nodes. Definition at line 120 of file CEvaluationNodeLogical.cpp. References compile(), CCopasiNode< std::string >::mData, mpLeft, and mpRight. Retrieve the infix value of the node and its eventual child nodes. Definition at line 95 of file CEvaluationNodeLogical.cpp. Definition at line 569 of file CEvaluationNodeLogical.cpp. References AND, compile(), EQ, GE, CEvaluationNode::getType(), GT, LE, LT, mpLeft, mpRight, NE, OR, CEvaluationNode::subType(), and XOR. Retrieve the display string of the node and its eventual child nodes in XPPAUT format. Definition at line 290 of file CEvaluationNodeLogical.cpp. References AND, compile(), EQ, GE, CEvaluationNode::getType(), GT, LE, LT, mpLeft, mpRight, NE, OR, CEvaluationNode::subType(), and CCopasiMessage::WARNING. Definition at line 501 of file CEvaluationNodeLogical.cpp. Create a new ASTNode corresponding to this OperatorNode. Definition at line 504 of file CEvaluationNodeLogical.cpp. References CCopasiNode< _Data >::addChild(), AND, EQ, GE, CCopasiNode< std::string >::getChild(), CCopasiNode< _Data >::getSibling(), CEvaluationNode::getType(), GT, INVALID, LE, LT, NE, OR, CEvaluationNode::subType(), CEvaluationNode::toAST(), and XOR. Definition at line 201 of file CEvaluationNodeLogical.h. Referenced by calculate(), compile(), getBerkeleyMadonnaString(), getCCodeString(), getDisplayString(), getInfix(), getMMLString(), and getXPPString(). Definition at line 203 of file CEvaluationNodeLogical.h.